They are TechnoRV and we are Geeks on Tour. Put us together and you'd think it would be a whirlwind of gadgets, websites, and TLAs (three letter acronyms!) But no ... we both also like to travel, eat, drink beer and wine, and solve the world's problems with our combined knowledge.We met Phil and Tracy (and their kids Ally and Josh) nearly 2 years ago and have enjoyed meeting up with them at all the rallies where we are both participating. This time we were parked just one coach apart at the NEAR rally so we made plans to spend the day together when the rally was over. First stop: the Magic Hat Brewery. I liked the 'Hex' microbrew best. Jim also liked it, so we had them fill a 'growler' (empty jug) to take home. 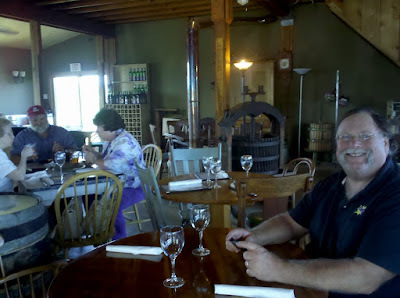 And then we were off to a local winery - Shelburne Vineyards. The clouds parted just as we were enjoying the wine tasting, so we took a glass and sat outside for a spell. We enjoyed the beautiful surroundings and lots of great conversation. C'mon, you didn't really think TechnoRV and Geeks on Tour could spend a day together without indulging in at least a little Digital Dreaming did you? Both of us really enjoy sharing our information and there's just never enough time to do it all at other rallies - so, we thought: how about a Techno Geek rally? Just us and our customers, or anyone interested in learning. And, the ideas just started pouring out. Phil likes Tai Chi, and he says he could do a class each morning to get everyone started. I said I'd like to have a photo-sharing and editing session each evening. Phil would give his digital photography seminar and maybe a daily assignment. He suggested that their daughter, Ally, could lead a photo field trip each day. She's really good, he says! 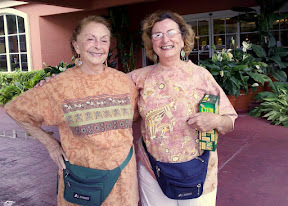 We could have a slide-show contest at the end - we'd teach Photo Story and MovieMaker. Of course we'd have plenty of blogging instruction and GPS navigating, maybe do some geocaching. Everyone would know what's going on because it would all be on Facebook. Both Jim and Phil could collaborate on presenting a Safe Computing seminar. And, we'd like to have an open Q&A session each morning. We all thought a 'show and tell' session would be fun, where everyone brings their favorite gadgets and talks about them. I think this rally needs to be at least a month :-)!! .It was hot in Vermont today. Mid-90s most of the day. And, of course, our Air Conditioner went out a couple days ago. Luckily, in this new rig, there are two A/C units - one in front and one in the bedroom. So, we could keep it bearable. Actually, since we're plugged in to 30Amp power, we could only run one A/C unit anyway. Since we're at a rally, there are reputable RV Repair people right on site, so it didn't take long for them to come over, check it out, get the necessary part - a new capacitor - and install it. $211 and we have our front A/C working again. Then we taught our Google Earth Seminar to a good crowd. And ended the day with our new hands-on Picasa photo editing workshop. I always think of some tweaking to do after teaching any class, but all in all, it went pretty well. I think we'll keep this in our repertoire! We're teaching it again here on Sunday, then we'll also be teaching it twice at the upcoming FMCA Convention in Madison, Wisconsin. 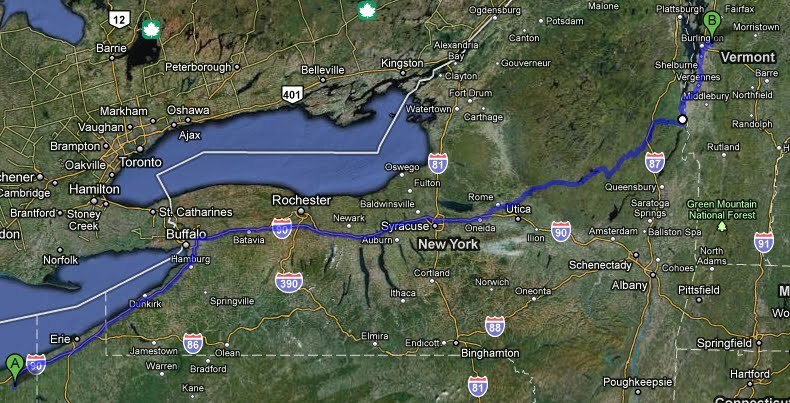 Our route to Vermont took us on the New York State Thruway and collected over $30 in tolls from us! Yes, we could tell our GPS to avoid toll roads, but it would have been longer and generally more of a hassle. As it was we were still being routed via the 'scenic route' after Utica. I don't thing we saw one other motorhome on the road we took thru the Adirondacks. I was gripping my armrest pretty tight on some turns ... Jim seemed to be having fun driving. Should we really be on this road with a big motorhome towing a car? The really fun part came when we got to the New York/Vermont border on a road called Bridge Road and we saw the sign that said 'Bridge Out.' 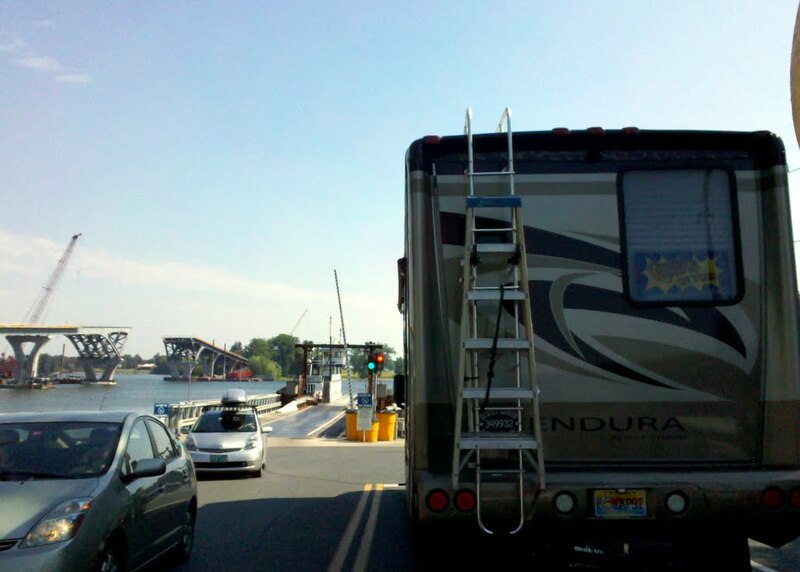 Not to worry we were told, there's a ferry, it's free and it takes big rigs all the time. Cool. Just a little bit further to Essex Junction where we'll be for the next week at the FMCA NE Area Rally. Here we are with friends enjoying some pre-rally happy hour and meals. We're parked right next to Phil, Tracy, Allie, and Josh of TechnoRV and Nancy and Dave of Absolutely Charming Jewelry. This really is a gypsy life ... or more accurately a 'Carnie'. Thanks for the great burgers Dave and Nancy! Who’d-a-thunk that Ashtabula county, Ohio would be such a treasure trove of sights and activities?! We’ve really enjoyed our stay here. 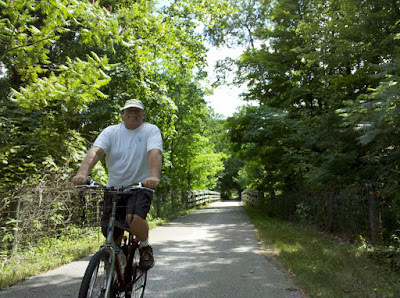 And, we even got some exercise riding our bikes on the Western Reserve Greenway Trail. 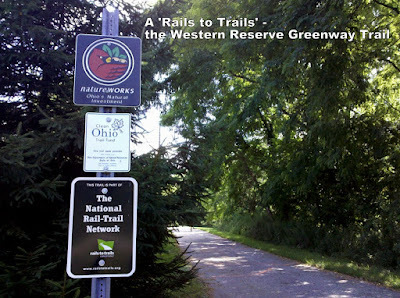 It’s one of the Rails-to-Trails system that has spoiled us so much for bike riding. Once you get used to these near-wilderness paved bike trails, you just can’t ride anywhere else! 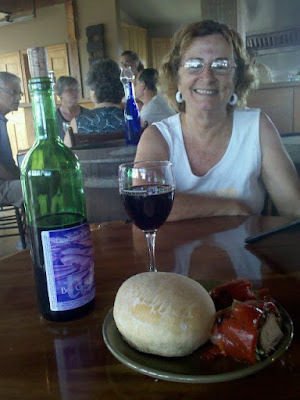 Next day we decided to check out a few more covered bridges, then have dinner at the winery that Howard and Linda of RV-Dreams had recommended. Geeeeeezz – this country is so picturesque! 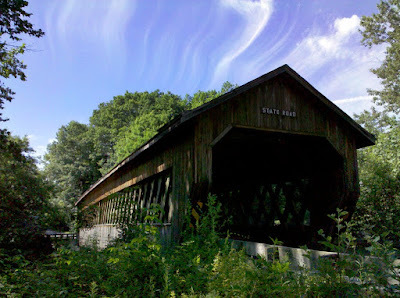 I was really kicking myself for not grabbing my good camera before we set out on this little jaunt – I could have spent all day just taking pictures of covered bridges. 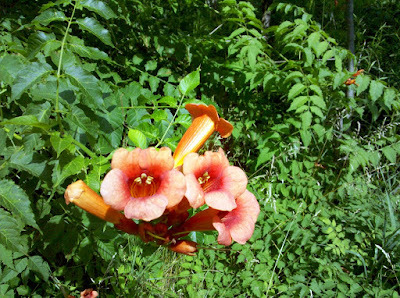 I’ve gotten so complacent with just taking out my phone (Droid) to snap photos. For little, onscreen pictures like this – I think it does a pretty good job – so I’ve gotten lazy. 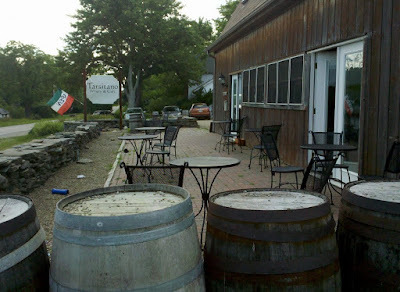 Then it was time for the wineries. 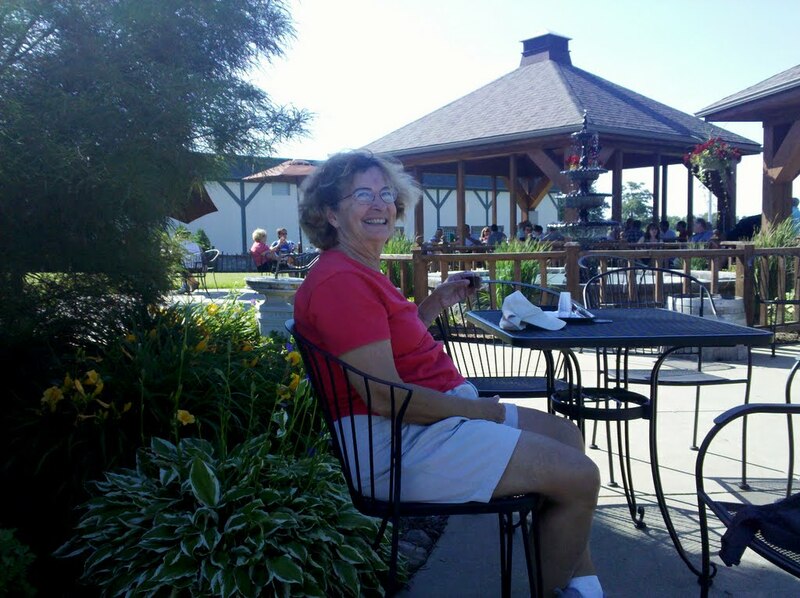 Believe it or not, there are lots of Ohio Wineries. We drove just a little further to the town of Conneaut which is right on Lake Erie and has several wineries. 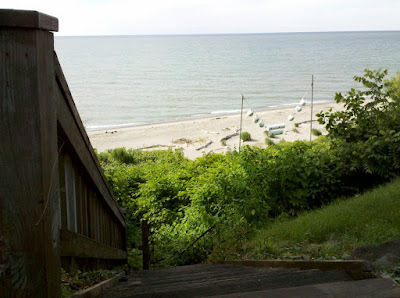 Homes are up on a hill and this picture shows a staircase leading down to the beach. Very inviting. As we drove around, both Jim and I were commenting on how much we liked this area. BUT, we reminded each other that it’s July … I’m sure this is covered in snow and VERY cold in the winter time. The Pièce de Résistance to end our day was dinner at the Tarsitanos Winery and Café. OMG was it delicious! Appetizer: Homemade bread, roasted red pepper stuffed with gorgonzola and Proscuto and basil. Good, chewy, wine. The best part was the homemade raviolis. If Jim ever sees me licking my lips while I’m sleeping … I’m dreaming of Tarsitanos! 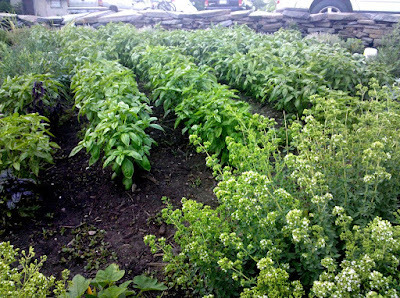 Basil - from the garden to your plate! Satisfied and satiated, we went back to Kenisee Lakes Thousand Trails. Ready to hit the road after a two week stay here. On to Vermont and the FMCA NE Area Rally. See our Facebook page for details on the seminars we’ll be doing there. 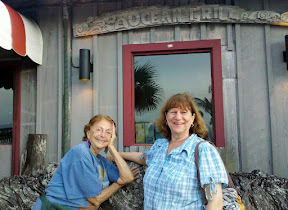 This past week, I flew down to Fort Lauderdale to spend some time with my Mom on her 80th birthday. A long time ago, after I had left home for college, law school and parts unknown, I returned home after over 10 years to find I had grown up to be exactly like my mother! Mom, of course, didn't remember the place - even though she was the one who initially discovered it. She doesn't remember anything any more - but she still enjoys the moment. This was sure different from her 70th birthday party when we went on a Shark Dive in the Bahamas! What a life she's had. I know she enjoyed this weekend though. The beach is her favorite place and it was just a dozen or so yards from our front door. 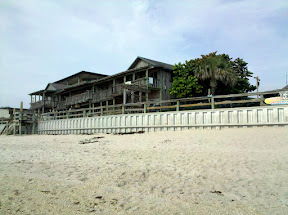 And we had dinner just down the street at the Ocean Grill. Ocean view all around made you feel like you were on a ship. 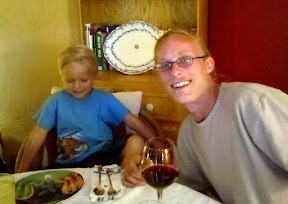 We also had a birthday dinner at Jo Ellen’s with Jim’s Dad as well since his birthday is next week. It was also great to see Devon and AJ. 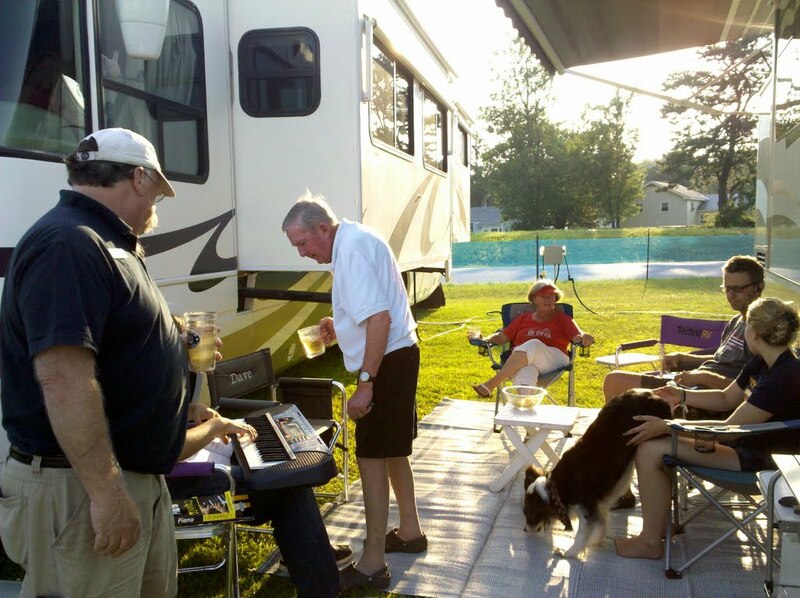 Meanwhile, back in Ohio – Jim completed several projects around the RV – new electrical outlets in the bedroom, hanging some pictures, reorganizing some cupboard contents, tuning up bicycles, fixing some plumbing issues … and that’s just what I’ve discovered so far. Who knew a geek could be so handy! He also spent some time with our friends Howard and Linda of RV-Dreams who came to stay in this same Thousand Trails park. They went to dinner and play (!) and one day for a kayak paddle. Being a smart man, and not needing to duplicate effort he let Howard and Linda take care of pictures and blogging! See their post at Paddling the Grand River. I had a bit of an adventure in my return flight as there was thunderstorms in Atlanta and my plane had to take a detour and stop in Augusta, GA. We eventually made our way to Atlanta after my connecting flight had departed. It was nearly midnight by the time Jim picked me up from the Cleveland airport and got me home. No I didn’t make a typo in the title, this is the day when Jim and I declared our love for each other and our desire to live together forever and be interdependent. 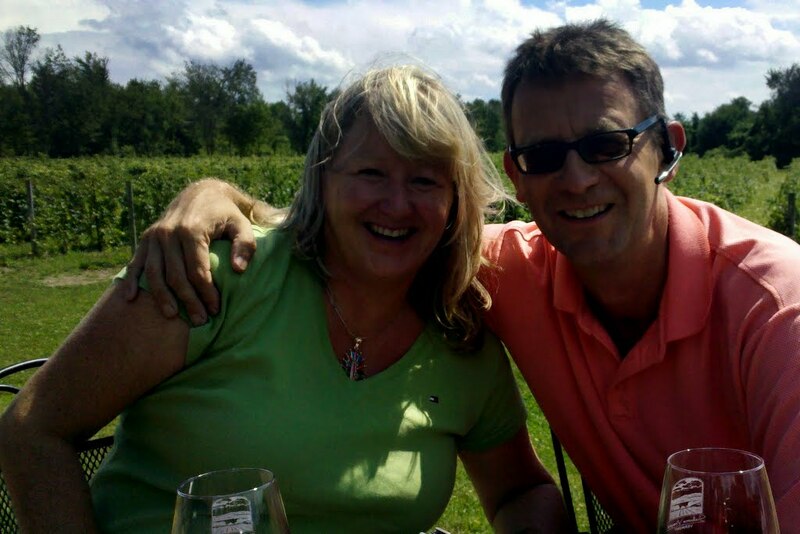 That was 13 years ago that Jim and I were married on the 4th of July – and I think it’s worked out quite well! It also means that it’s quite easy for us to remember our anniversary, and it’s also pretty easy to get away and find some interesting way to celebrate. This year, we are at a Thousand Trails park in Ohio called Kenisee Lake. 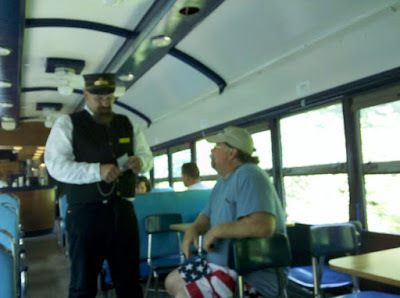 We looked at the park website for any suggestions of cool things to do and found the Ashtabula, Carson and Jefferson Railroad that gives tourist rides on weekends. You'd think we'd be sick of train sounds after our month at the Fairgrounds with something 85 trains ever day! But it was quite different when you're riding. Play this little video to hear. That was fun! 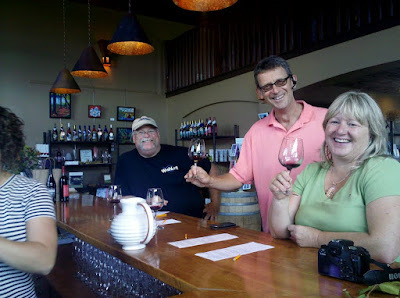 Then we were off to sample one of the many wineries around here. Interesting how they served the tasting ... in pre-poured one ounce glasses rested on a place mat with the wine names. 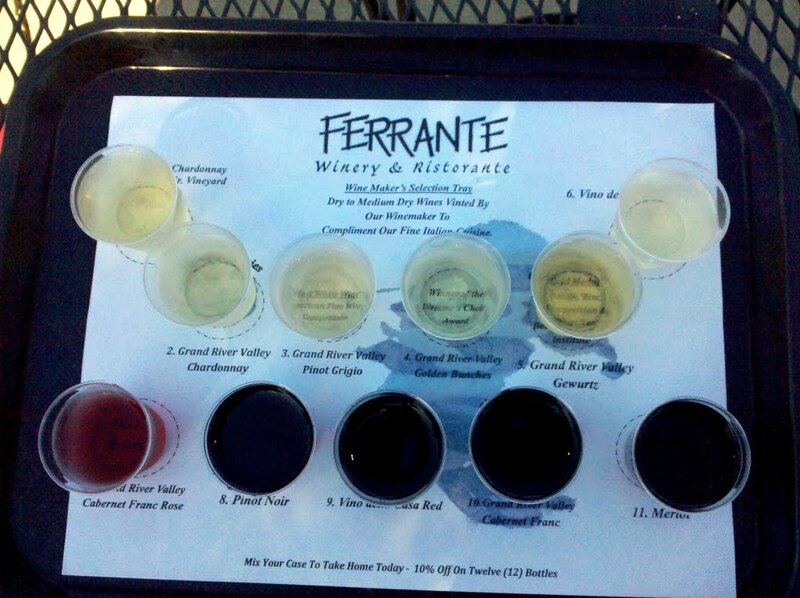 I much prefer the wineries where you stand at a bar and a person pours each sample into your glass wine glass. And I must say I prefer California wines to those we sampled in Ohio too. But I drank 'em all without complaints! And the weather and ambience was spectacular. Even live music on their patio area. A truly beautiful 4th of July weekend. This was actually Sunday, the 3d - because that's the only time the train runs. Come to think of it, that's another good thing about our anniversary - it's always a long weekend! We'd heard that the closest place for fireworks would be Geneva by the Lake, so after the wine tasting, we took a drive to scope it out. Pretty - but WAAY too crowded, I think we'll pass on fireworks this year. Besides, they won't start till 10pm because it stays light so late. So, on Monday the 4th we just took it easy at home and did computer work. Here's Jim at his new workstation. Isn't that a nice view out his office window? About 7pm the light was getting so pretty, we took a drive to another of the local attractions ... covered bridges. 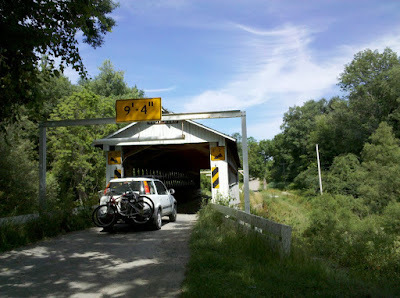 There's a dozen or more covered bridges in Ashtabula County. This is the longest one - or at least it was until the built a new longer one just a couple years ago. Just an exquisite weekend! Now I'm packing up to fly to Florida for a few days. 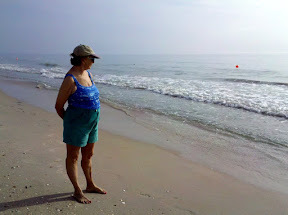 It's my Mom's 80th birthday and I want to be with her and do something nice. I will be taking a computer, but I probably won't blog - I'll let Jim have custody of the blog till next week! Jim likes to drive the motorhome. I like being the passenger. But, I hadn't driven this new RV at all, and I figured it was time. I would like to take an RV driving class sometime, but for now I just wanted to break the ice. So, I got behind the wheel to see how it felt. Wow - I didn't know we had power seat controls on this! In the last motorhome I had to sit on a pillow, this one I could adjust just perfect. And, the mirrors also have power controls. Being a Class C means it feels more like a regular vehicle ... the front wheels are in front of you, not underneath you like in a Class A. It all was perfectly comfortable, so we took off. I planned on just going a couple of freeway exits then stop and give the reigns back to Jim. But, I just kept on going. I drove thru Cleveland with big city traffic and cloverleaf freeway exchanges. Then, on the other side of town there was construction. It seems like I always get construction when I'm driving! Chris finally drives. This rig is just as easy and much more comfortable than the last one. When I was driving on this narrow stretch of road with the concrete wall on one side, I felt the bigger size of this RV. My hands were starting to slip on the steering wheel from sweating! But, I made it and we pulled into Thousand Trails about 3:30. Low Clearance bridge on the way to Kenisee Lakes Thousand Trails. This picture taken on a car ride! We took an alternate route with the RV. 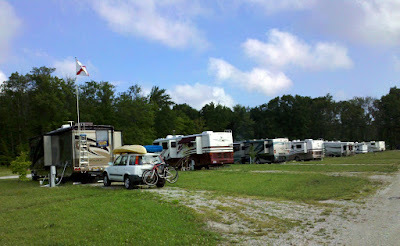 Once we pulled in, I lucked out and didn't need to back into a site since there was a pull-thru, 50Amp site available. Piece of Cake!